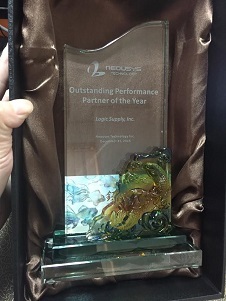 Global Industrial PC company Logic Supply is pleased to announce that it has been named 2016 Partner of the Year by Neousys Technology, a Taiwan-based manufacturer of rugged embedded computers. FEBRUARY 07, 2017 (SOUTH BURLINGTON, VT) - Industrial and embedded computer specialist Logic Supply, is pleased to announce it has been named the 2016 Partner of the Year by Neousys Technology, a Taiwan-based manufacturer of rugged computers. "We are proud to name Logic Supply as our 2016 Partner of the Year," said Roy Wang, Vice President of Neousys Technology. "As our largest distribution arm in North America, Logic Supply serves as a critical resource for project customers requiring the full suite of integration, engineering, and delivery services." Logic Supply offers the Neousys product line from both its North American and European branches. Top sellers include the Neousys POC-200 and the Skylake powered Nuvo-5000. Many of Logic Supply's project customers utilize the in-vehicle features offered by Neousys, including onboard CAN bus, 8~35V DC input with ignition control, and -25C ~ 70C operating temperature ratings.